Another year, another month of students complaining about the University’s housing lottery. The limited amount of housing creates a situation by which many students are left without housing, and there will always be dissatisfaction until more housing is built — a priority this board urges the University to act on. Until then, we have to work within the system that currently exists. The Department of Community Living has made some improvements in the past few years, but there is still more that can be made. When the Department of Community Living posted housing lottery numbers, it advertised a plan to make laundry “free” starting next school year, based on the results of its SkyFactor survey. On March 13, each student enrolled in the housing lottery received an email informing them that their number had been posted and that use of the laundry facilities would be free from Fall 2019 on, an initiative this board commends. One of the wonderful things about going to a university like Brandeis is being able to hear intellectual leaders, change-makers and industry powerhouses speak about their work. Clubs, organizations, institutes and departments all work to bring important individuals to campus so that members of the Brandeis community can learn directly from their personal experiences and scholarship. Recently, the University has hosted a wide range of influential speakers. The 2019 Student Union presidential election has several well-qualified candidates, each of whom has a vision for creating a better Brandeis. Candidates Lizy Dabanka ’20, Oliver Price ’20 and Simran Tatuskar ’21 have similar ideas on how to improve campus life, such as working to improve the relationships between students and the University and ensuring that student needs are met. However, the candidate with the most concrete vision of how to improve the Union is Tatuskar. As such, this board endorses Simran Tatuskar for 2019-2020 Student Union president. Recently, Brandeis launched Duo Security's two-factor authentication system as a means of protecting students and their personally identifiable information, according to a Nov. 6, 2018 article in the Justice. This new security measure is a required part of the transition to Workday, the new human resources software that the University is currently adopting, per a Nov. 20, 2018, Justice article. Student employees are the first students required to enroll in Duo, with many students being required to enroll by March 7. After logging into a Brandeis website, students must confirm that log-in through a push notification, text or phone call, a step added by Duo. T. While this is a commendable first step to improve cybersecurity, the decision to implement such software has several oversights, and this two-factor system might not be accessible to all students. One of Brandeis’ enduring infrastructural problems is the atrocious laundry system. 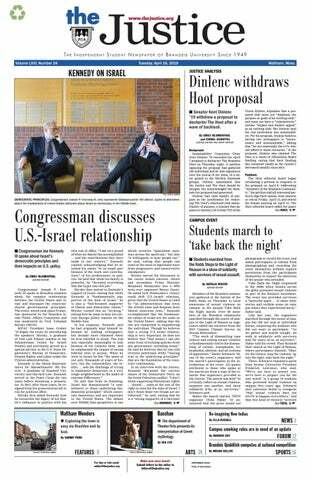 In a Jan. 28 email to the Brandeis community, University President Ron Liebowitz announced the creation of a third task force to address campus infrastructure. This board urges the task force to consider improving laundry on campus. Although the BCC has hired more counselors in the past few years — and this board acknowledges that this is difficult — some students go off campus or to group therapy sessions for their specific needs. Von Steiger said that in order to accommodate the many students who seek therapy sessions, the BCC cannot offer students more than one appointment per week. To accommodate students that need to see a therapist more than once a week, the BCC offers the option of going off campus. This board appreciates that the BCC helps students find these opportunities, but recommends that with the approval of the administration, the BCC should help to make sure students who go off campus have the means to do so. Providing additional transportation to the location the individual is referred to can help students financially and make the experience even more positive. Off campus therapists can be in Newton, Cambridge or Boston, according to Von Steiger, so subsidizing commuter rail expenses — which the Student Union already plans to offer for students pursuing internships in Boston, according to Union President Hannah Brown ’19 — is a possibility. This year’s ’DEIS Impact, Brandeis University’s annual social justice festival, featured 52 events. Unfortunately, this is the most impressive thing one can say about ’DEIS Impact. Though the festival’s name suggests that attendees should walk away with some sense of how Brandeis students can make an impact — either on the University itself or on society as a whole — the majority of its events provide little guidance to that end. This shortcoming, however, is only one of the reasons the festival as a whole is so poorly attended.